US Assistant Secretary of State Jeffrey Feltman has said Libya's rebels have accepted an invitation to open a representative office in Washington. Mr Feltman is the most senior US diplomat to visit the rebels in their de facto capital Benghazi. The US has insisted that Libyan leader Col Muammar Gaddafi step down, but has not given the rebels full recognition. The visit came as Nato planes launched a series of air attacks on Libya's capital, Tripoli, the heaviest so far. 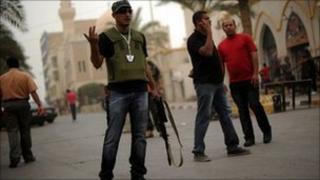 Libyan officials say three people were killed and dozens injured in an attack on the barracks of the popular guard. Nato says it bombed a vehicle depot next to Col Gaddafi's Bab al-Aziziya compound which had been used by his forces in attacks on civilians. However, the Libyan government described it as a reserve military base and said the casualties were civilians. On Monday, France announced it and the UK would also deploy attack helicopters to escalate strike power but a British minister has said no decision had been taken. Nato is enforcing a UN resolution to protect Libyan civilians, following the uprising against Col Gaddafi's rule. Mr Feltman said the US was not negotiating with Col Gaddafi, and that the rebel Transitional National Council (TNC) was the legitimate representative of the Libyan people. "I delivered a formal invitation to the council for the opening of a representation in Washington," Mr Feltman said at a news conference. "We are happy they accepted it." "We have no office in Tripoli now. And we asked the Gaddafi people to close their embassy in Washington. Our officials see members of the council, the council sees us," he added. "There is an ongoing diplomatic, political relationship and dialogue with members of the council who are considered by our fellows credible and legitimate representatives of the Libyan people." But Mr Feltman said there was no point in formally recognising the council as "its job is to go out of business" - it plans to wind itself up in the event of the country being reunited and Col Gaddafi overthrown. He said the US had already contributed $53.5m (£33.1m) in humanitarian aid and $25m in non-lethal military supplies. Mr Feltman also expected the US Congress to release frozen Libyan government assets to be used for purely humanitarian purposes, he added. European Union foreign policy chief Catherine Ashton opened an office in Benghazi on Sunday. Germany has also announced the establishment a liaison office there. AFP news agency reported that the rebels would shortly nominate someone to represent them in Paris. Only a handful of countries, including France and Italy, have recognised the TNC as Libya's legitimate government. On Monday, French Defence Minister Gerard Longuet confirmed media reports France was deploying attack helicopters to Nato's Libya mission. French Foreign Minister Alain Juppe said 12 Tiger- and Gazelle-type helicopters were being despatched to Libya. He also said Britain would send helicopters. But in Parliament on Tuesday UK Armed Forces Minister Nick Harvey said "no decision" had been taken to send attack helicopters although it was being considered. Nato jets have been targeting Col Gaddafi's military infrastructure, but have been unable to stop the fighting. Rebels control much of Libya's east, while Col Gaddafi's forces control most of the west of the country. The rebellion against his rule began in February, spurred on by uprisings in Tunisia and Egypt that saw the presidents of those countries overthrown. Are you in Libya? Are you affected by the Nato strikes? Send us your comments and experiences.